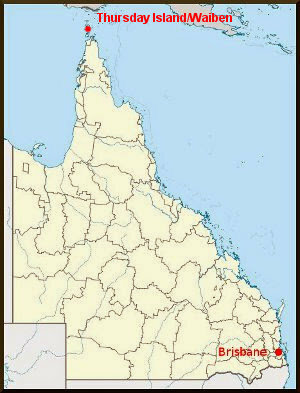 Thursday Island, in the Torres Straits between Cape York and Papua New Guinea, has been populated for thousands of years and is known in the local language as Waiben. 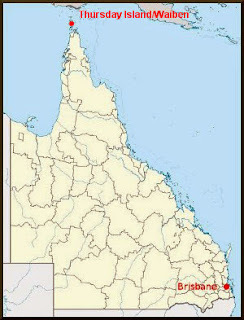 The island became a Queensland Government administrative centre for the strategically-important Torres Straits in 1877, and during the 1880s a lucrative pearling industry developed there, attracting a multicultural workforce from places such as Japan, Malaysia, India and the South Sea Islands. The prison there started life as a police lockup and by 1885 had two cells and staff quarters. The prisoners held at this time were described in government records as being ‘nearly all of the coloured races and mostly sailors, very few of whom speak English’. As hard labour, they were made to cut wood for the government, or work as sailors and sailmakers on government ships. As economic activity at the island grew, so did the prison population and the lockup was extended to six cells in 1887, and an eight-person ward was added in 1890. The lockup was officially declared as HM Prison, Thursday Island, in February 1891. This allowed it to hold prisoners serving sentences over 14 days, saving the expense of sending them to mainland prisons. The buildings were improved in 1895, allowing up to 40 prisoners to be housed there. At the time the population of the island was about 2,000 and the daily average number of inmates was 15. One of the more famous criminals to be held there Hatsuro Abe, a Japanese sailor and pearl diver who killed his lover on the island in 1894 and was eventually hanged at Brisbane's Boggo Road for the crime. During the following year, Filipino man Frank Tinyana stabbed Senior Constable William Conroy to death during a struggle on the island and he too was sent to Brisbane for execution. 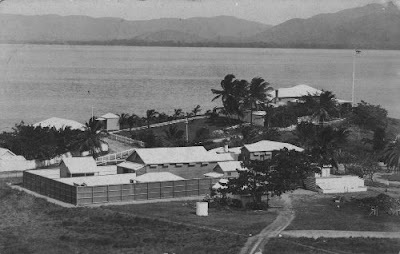 Thursday Island prison remained open during the 20th century but by the 1970s the main section had decayed away and the prison had shrunk to a two-cell facility with a daily average of three prisoners. A government report in 1980 described it as empty and ‘virtually useless’, and it was demolished in 1980-81 to make way for a ‘Police and Prison’ complex, but construction on the new facility was deferred. In the meantime, short-term inmates were kept in the island watch-house and longer-term prisoners were shipped to Townsville or Rockhampton. In July 1983 the island prison was officially declared closed.